There’s a history to the BabyHatches. Isn’t there always a history to the story? You think you’re living in the present but the past is right behind you like a shadow. The beginning of The Gap of Time, Jeanette Winterson’s cover version of The Winter’s Tale, opens in an American city called New Bohemia. Here we see recently bereaved Shep, find a baby in a BabyHatch and take her home. I am learning to be father and a mother to her. She asks about her mother and I say we don’t know. I have always told her the truth – or enough of it. And she is white and we’re black so she knows she was found. The Hogarth Shakespeare series launched in October 2015 with The Gap of Time – Jeanette Winterson’s reinvention of The Winter’s Tale. The story of a king whose jealousy results in the banishment of his baby daughter and the death of his beautiful wife. His daughter is found and brought up by a shepherd on the Bohemian coast. The narrative moves to London, a city reeling after the 2008 financial crisis where we find out how the abandoned baby ended up in a BabyHatch. We meet The Winter’s Tale characters transformed. Leo (Leontes) is no longer King of Sicilia but an ex banker with a hedge fund, a helicopter, and a personality that verges on the sociopathic, while his wife MiMi (Hermione) is a famous French folk singer complete with wikipedia entry. As in the original, the dramatic events accelerate when Leo blows a gasket over unfounded suspicions that his wife has been sleeping with his best friend, Xen (Polixenes) who is a US-based writer of computer games. Xeno was running. He was fast but the jeep was faster. The neon overheads blurred. Numbered bays – 20, 21, 22, 23, 24, 25. A metal screen ahead. The Jeep was right behind him, Leo’s fist on the horn. Reno could feel the heat from the engine. Leo was going to crush him agains the barrier. The narrative was fast-paced and at times I felt as though I was a passenger in a very fast car. The doors were locked and I had no choice but to either enjoy the ride or start shouting, ‘Let me out’. Winterson sticks closely to Shakespeare’s original, even giving a brief synopsis at the beginning of the novel. Some readers may not like the convenience of tying up loose ends but the difficulties of Shakespeares original are cleverly handled and transposed into modern life complete with romantic endings. Boy meets boy, boy gets girl, girl meets girl, and long lost people reunited. 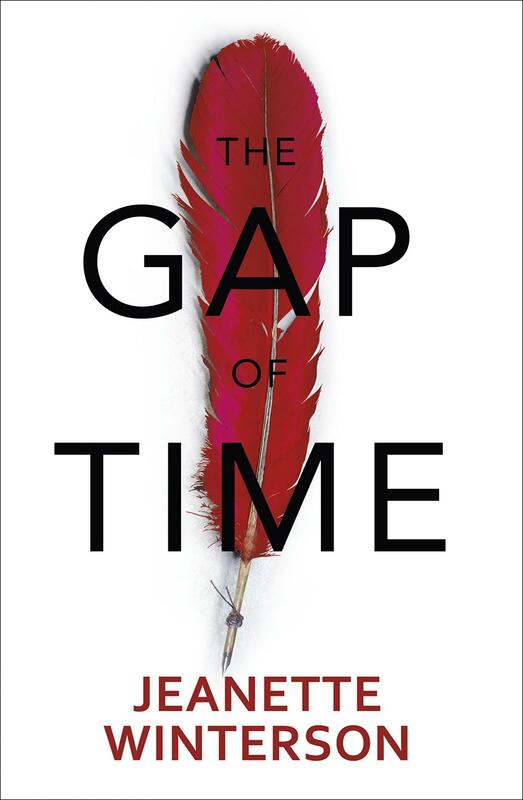 The Gap of Time is a novel about loss and love, about forgiveness and possible futures. So many stories of lost and found. As though the whole of history is a vast Lost-Property Department…The missingness of the missing. We know what that feels like. Every endeavour, every kiss, every stab in the heart, every letter home, every leaving, is a ransack of what’s in front of us in the service of what’s lost. It’s a story about a foundling, an orphan, a stolen child, an abandoned child. But ultimately, it is a story about forgiveness and the power of love. All of us have talismanic texts that we have carried around and that carry us around. I have worked with The Winter’s Tale in many disguises for many years. This is a brilliant opportunity to work with it in its own right. And I love cover-versions. By that I mean part of the written wor(l)d I can’t live without; without, not in the sense of lack, but in the old sense of living outside of something. It’s a play about a foundling. And I am. This major international project will see Shakespeare’s plays reimagined by some of today’s bestselling and most celebrated writers. The books will be true to the spirit of the original plays, while giving authors an exciting opportunity to do something new. A further three novels will be published in the series during the 400th anniversary year of Shakespeare’s death in 2016: Howard Jacobson’s The Merchant of Venice in February, Anne Tyler’s The Taming of the Shrew in June and Margaret Atwood’s retelling of The Tempest in October. The first four in the series will be joined by Tracy Chevalier’s Othello, Gillian Flynn’s Hamlet, Jo Nesbo’s Macbeth and Edward St Aubyn’s King Lear. Thanks to Eric Karl Anderson @lonesomereader for the copy. This entry was posted in Blog, Orphan Lit, Reviews and tagged foundling, Jeanette Winterson, orphan, Shakespeare. Bookmark the permalink.